Former Charlotte 49ers pitching star Adam Mills has been called up to the Class AAA Pawtucket Red Sox and is tentatively scheduled to be the starting pitcher in the Red Sox's game Tuesday night against the Charlotte Knights in Fort Mill, S.C. 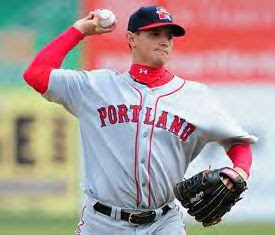 The Knights host a four-game series with Pawtucket starting Monday, with each game beginning at 7:15 p.m.
Mills has been pitching this season for the Class AA Portland (Maine) Sea Dogs. On Thursday, Mills won his eighth consecutive start and improved to 10-5 on the season. Mills is the first pitcher in the Sea Dogs' 16 year history in win eight straight starts. He is the third pitcher in the league this season to record 10 wins and just the 14th in Sea Dogs franchise history. Since June 27th, Mills is 8-0 with a 1.98 ERA. The 5-foot-11, 190-pound righthander was drafted by the Boston Red Sox in the 8th round of the 2007 Major League Baseball draft. Mills helped lead the 49ers to their first-ever Atlantic 10 championship and a school-record 49 victories in 2007, and was named a first-team All-American by Collegiate Baseball and the National Collegiate Baseball Writers Association. Mills, 24, ranks first in Charlotte 49ers history in victories (32), starts (51) and shutouts (five).